Postcards from the early 20th century have always fascinated me. There is something about the stylistic quality of the illustration and design, but more over it’s usually the language or the message that is represented. The postcard below is from about 1910 I’m thinking. There was no date on it so it’s hard to tell, but the look Seems to say 1900 to maybe 1914. It is a cautionary message about the perils of the 4th that have been with us since the Chinese invented fireworks. It’s also an advertisement pitching “take a photo of your kid before he kills himself celebrating the birth of our nation”. So here we are about 100 years later. Mom’s and Dad’s in places where fireworks are legal… bust out your camera and take a photo of your kid this morning before it’s too late. Happy Fourth of July! 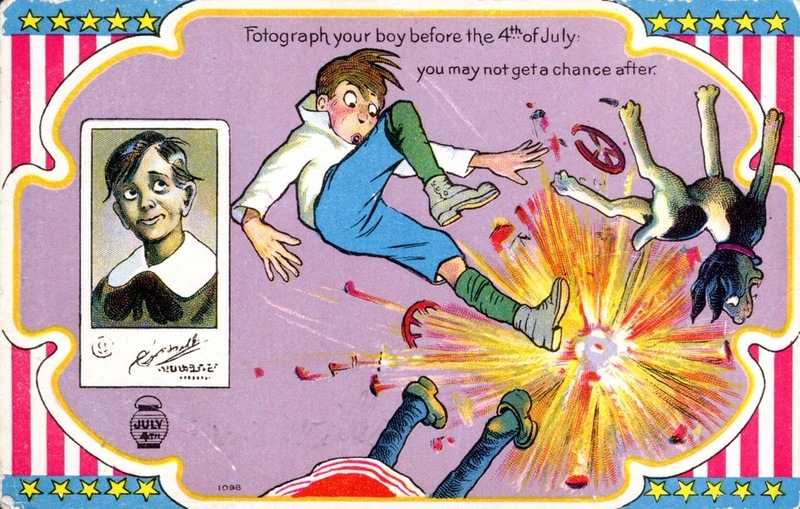 Posted in General and tagged Design, fire cracker, Fireworks, Fourth of July, Illustration, july fourth, post card, Postcard, Vintage on July 4, 2014 by Author. ← The Art of Making Scissors.